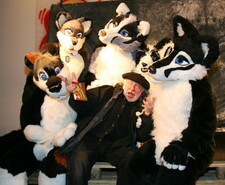 The chilly start to December saw another example of furries in the mainstream art world at the French exhibition Rassemblement des Mondes Hors-Pistes - or Assembly of the Off-Track Worlds to those not proficient in French - where the fandom's artistic qualities were put on show for TRACKS, a French TV magazine showcasing subcultures and independent artists broadcast on French-German culture channel Arte. This isn't the first time furries have been on Arte, with another TRACKS report from Conifur Northwest in 2002. The Eurofurence staff were invited along to the festival; where they sold examples of furry artwork, literature and comics in the main hall. Up on stage fursuit DDR was a big hit and a photo shoot followed soon after. Reportedly 3700 people attended the festival, including many influential journalists, artists and politicians. Arte will be broadcasting a special on the event in March 2008.